Tapping his toes to an inaudible beat, tilting his iPad left and right, so the screen flipped up and down and sideways. A sheet of paper covered with scribbles and notes lay flat on the table top alongside an uncapped pen - both undisturbed the whole time he sat there, an ill concealed attempt at studying. He rummaged through his backpack again, then ran his fingers through his thick curly hair and scratched at his scalp. He looked down at his iPad for another two minutes, eyes unfocused, before he looked up again and let his eyes roam around the room. A moment later, he was posed in a slight yoga contortion with his arm wrapped around his torso, rubbing the opposite shoulder. Honestly, I don’t make it a point to stare. It can be rude and awkward. But when the guy not five feet away from my person is well on his way to crawling out of his skin, I can't look away. I suspected too much caffeine. Or drugs. The coffee cup went up to his lips, and then down again. 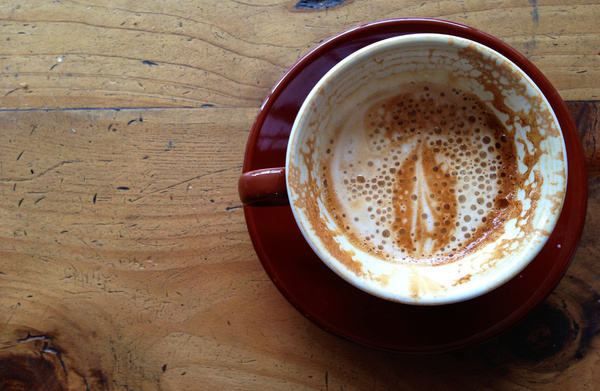 He got up abruptly, walked around the coffee shop, and then sat down again, legs banging against the shared table. He went through the same set of motions again and I started to get worried. For our safety (and his sanity). All of a sudden, up he leapt and walked briskly out the door, leaving behind all of his things. Three minutes later, he appeared at the checkout counter anxiously shepherding forward a petite girl, shoulder slightly collapsing under the weight of her loaded bookbag. She had the longest eye lashes and fluttered them just-so, gingerly sat down next to him, and pulled out her textbook and started reading. His movements became less manic. They shared a coffee cup. She leaned over and gently touched his shoulder to ask the occasional question. He laughed and casually answered them as he stared intently at his iPad screen. She, subdued, went back to her book, eyes occasionally darting over to glance at him. awwww...was this something you actually witnessed? Or a work of fiction? Well written, dear. Very nicely written, Ruth! I want to hear more about them. Brilliant piece of writing there, girl. I feel like I *know* them. Very sweet. I wonder if the girl realizes how much power she has at the moment??? Poor boy. Lucky boy. I'd like to think I was less fidgety in those situations. We all like to think we play it cool, but only those around us know for sure. Great observations! I love your writing style! Is this even real? I feel like I'm reading a novel! Nice written, Ruth. *squeals* oh my gosh! i love this. you are on your a game girlfriend! Beautiful. I don't know whether it happened or not, but I feel like I just witnessed it anyway. um, more please. i need a new book to read and i want to read this one. thanks. I love your story telling, it's like the first chapter of a book. I can't wait to learn why he was fidgeting and now why she was. Keep people watching and writing :).